The members of Nosebleeds had never done an interview before. In fact, over the last year they graduated from performing in garages to playing shows around the Fox Cities in Wisconsin. In May 2018, they released their self produced album “Good Boy!” and from there began to accumulate a following on social media. The band is in the middle of its slow rise in the DIY pop punk music scene. 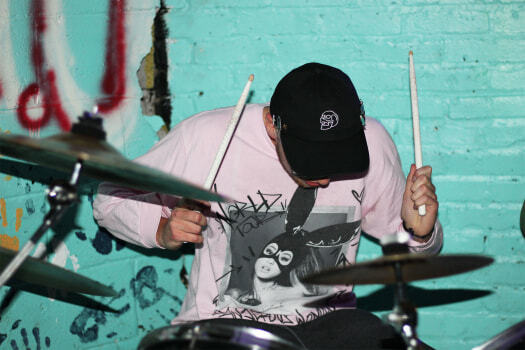 Lead vocalist Jack Ratajczak playing with his band Nosebleeds. Courtesy of Nosebleeds. Photo taken by Sara Soroko. The members of Nosebleeds and I met years ago and formed a relationship through concert and marching band. In June 2018, I watched them perform at Alley Cat Coffeehouse in Hortonville, Wisconsin, where we got back in touch. In early 2019, Nosebleeds sat down with me to talk about how three kids from the Fox Valley in Wisconsin got their start in the punk music scene. The band is made up of Jack Ratajczak, Mike Lynaugh, and Paul St. Aubin. All three members graduated high school last May. 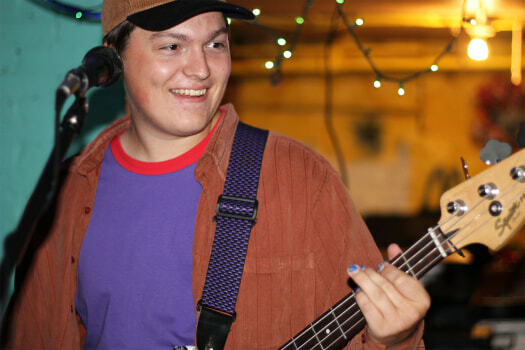 Ratajczak briefly played for Polar Vortex, a cover band in the Fox Cities area, prior to Nosebleeds. Lynaugh and St. Aubin had numerous short lived projects throughout middle and high school. But when Lynaugh, Ratajczak, and St. Aubin got together with friend Eli Creel in summer 2017, something clicked and Nosebleeds was born. Creel left Nosebleeds a few months after it was established, although he plays on the original “Parasomnia” recording. Soon after Nosebleeds formed, St. Aubin attended a concert in the garage of Wisconsin musician Brady Laflen. After the two met, Laflen invited Nosebleeds to play the next show in his garage. “We had a five song set list, but I remember we played through our entire set so fast,” Ratajczak said. The band had prepared two covers in addition to three originals in efforts to pad their set. “The adrenaline really got to us,” Lynaugh said. From then on, nothing could beat the rush of playing for a live audience. Drummer Paul St. Aubin mid-performance. Courtesy of Nosebleeds. Photo taken by Sara Soroko. Over the course of our time together, St. Aubin acted as the spokesperson for the band. On and off stage, his face is never without a smile. St. Aubin has a glowing and humble personality. His dog, Zimbu, is on the “Good Boy!” album cover. Zimbu earned that prestigious spot after being present at every rehearsal. The band members joke that Zimbu likes Lynaugh the best. The bassist is more than a dog whisperer, he’s a living testament to punk culture. At concerts, his style ranges from rocker dad to thrift store chic. He’s a color blocking aficionado, and wears two different colored converse as a pair. 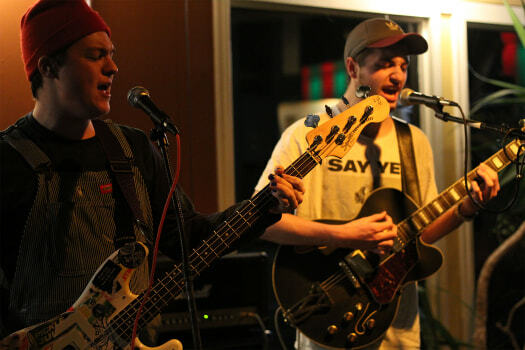 Lynaugh donned a pair of pinstriped Oshkosh B’gosh overalls under his bass guitar at a recent concert giving off a vibe that screamed “railroad conductor by day, skater by night.” Lynaugh embodies the punk scene in his entire being. In conversation he is concise with his words. In concert he lets his vocals run raw. This is part of the style of the Nosebleeds. Nothing is overproduced. The members of Nosebleeds are as genuine as the lyrics they write. Their excitement during the interview was contagious. Their pride for what they have accomplished over a short period of time, including producing their debut album on their own, is warranted. “Originally, we thought we had only enough ideas to maybe have an EP,” Lynaugh said. “But by the time we went through all of them, we realized we had enough for a full-length album, so we went with that.” The Nosebleeds guys are the type to go with the flow. They don’t have a top secret artistic plan. Bassist Mike Lynaugh laughing along with his bandmates. Courtesy of Nosebleeds. Photo taken by Sara Soroko. “Good Boy!” embodies the naive experiences and overpowering emotions of teenage years. The lyrics are unembellished and to the point. In “Bread For Breakfast,” Ratajczak’s raspy voice sings, “Muster courage to ask you out/Will you say yes?/I surely doubt/Wonder how I will get your number/What’s this spell that you have me under?” It’s relatable, it’s nostalgic. Hypnotic, whiny melodies rattle around in your head for days after listening to “Good Boy!”. It’s hard not to sing “Bread For Breakfast” while making toast in the morning. The lyrics show the youth of the band, but the music is where Nosebleeds shines. The buildup and release caused by the melancholic riffs—like in “100,000 Miles”—is satisfying and not dramatized. You can expect Nosebleeds to play in Iowa as early as this summer. The band will be making an announcement about new shows and the next album soon. “Don’t sleep on us,” St. Aubin said. Guitarist Jack Ratajczak playing passionately. Courtesy of Nosebleeds. Photo taken by Sara Soroko. Mike Lynaugh (left) and Jack Ratajczak (right) playing together. Courtesy of Nosebleeds. Photo taken by Sara Soroko.